Medical qigong uses qigong to reverse or mitigate chronic disease and injury. 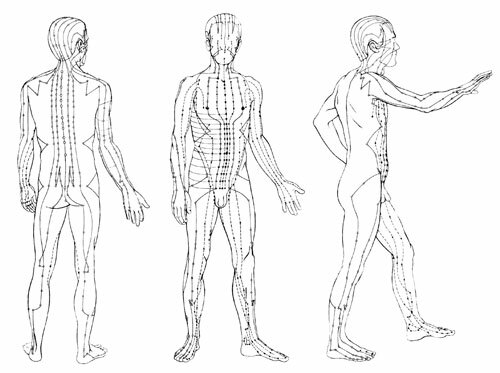 Because most Chinese physicians are familiar with the acupuncture meridian-line system, the vast majority of China’s medical qigong programs are based on this. The focus is on medical therapeutics, rather than spirituality or extreme physical or mental prowess. Medical qigong is used either as a primary therapy or as an adjunct therapy with other forms of traditional Chinese medicine, such as acupuncture, herbs, bone-setting and ordinary massage. It is also used as a complementary therapy in conjunction with Western medical practices and drug therapies. Qigong forms are practiced to heal and regenerate the body, reduce stress, calm the mind and soothe the central nervous system. 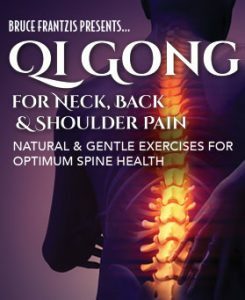 Qigong can target specific illnesses or body functions. For example, Dragon and Tiger is used in China to help treat cancer and mitigate the effects of chemotherapy and radiation. Using traditional Chinese medical and qigong diagnostic methods, qigong doctors design exercises for specific health problems, similar to the way herbalists create prescriptions. The treatment and how the exercises are done change as the individual progresses. 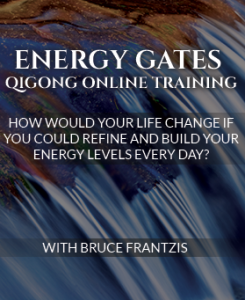 Qigong tui na therapists can project energy from their bodies to move and re-balance the energies of their clients. They may also use hands-on techniques to manipulate their patients’ tissues. Chi circulates throughout the entire physical body through energy channels. Some are located near the surface of the body and others are deep inside. Many Chinese medical therapies—from acupuncture to acupressure to many forms of qigong—work by activating some or all of the body’s twelve main and eight extraordinary acupuncture meridians (energy channels) and some or all of its seven-hundred-plus acupuncture points. Throughout most of the body, the acupuncture meridians are either located within or connected to a layer of chi that is located just underneath the skin in the subcutaneous tissue between the skin and the muscles (wei chi). Wei chi helps protect the body from intrusion by outside energies such as heat, cold, dampness and other people‘s chi. Acupuncturists attempt to heal the body by inserting needles into specific points along meridians to break up chi blockages and to stimulate and balance chi flow throughout the body. Increased energy flow through a damaged area can release blockages, improve blood circulation and regenerate injured tissues. An increase in flow in one meridian or area will stimulate greater flow in other meridians and areas of the body. 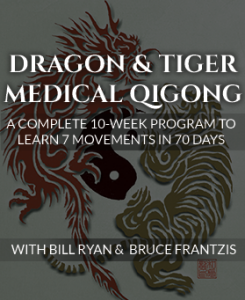 Qigong exercises that are called ”meridian-line qigong” systems—of which Dragon and Tiger is one—are designed to stimulate acupuncture meridians and points. 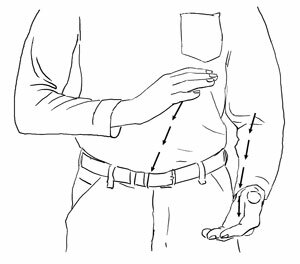 Rather than use needles, qigong practitioners choose a meridian line or point they wish to affect and sweep their hand through the etheric field nearby. The chi in the etheric field and the chi in the wei chi are very strongly linked. In a healthy person there is a great deal of chi movement between them. Therefore a physical hand movement in the etheric field will stimulate energy movement there which in turn will stimulate energy movement in the wei chi and the acupuncture meridians nearby. Different meridian-line qigong systems use different types of hand movements over different meridians in different sequences. Most seek to stimulate and balance the energy of the whole body. More complex systems require up to one hundred movements to balance specific channels and points on which they focus. These systems take a tremendous expenditure of time and effort to learn and require much daily practice. Dragon and Tiger is simple. 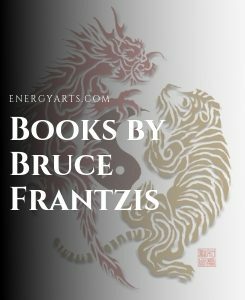 Rather than focusing on specific individual meridians or acupuncture points, Dragon and Tiger moves energy through groups of meridians during each movement. When you complete all seven movements, you will have activated and balanced all the major acupuncture meridians of the body. Other energy channels and centers such as the left, right and central channels and the mingmen and lower tantien that are found deeper in the body are also affected but not as strongly.